Mr. Chaiyong Puapongsakorn, Governor of the Metropolitan Electricity Authority (MEA), and Rear Admiral Yongyut Phrompromrach, Commander of the Bangkok Naval Base of the Royal Thai Navy, jointly signed a MOU to improve and develop the resourceful ecological system of the mangrove forests and the coastal protection belts against erosion under MEA’s Model and presided over the opening ceremony of the reforestation activity to honor Her Majesty Queen Sirikit of the late King Rama IX to renew natural resources, to expand forest areas for natural rehabilitation of the environment and to implant power poles as coastal protection belts at King Rama V Fortress, Bangkok Naval Base, the Royal Thai Navy, Laem Fa Pha Sub-District, Phra Samut Chedi District, Samut Prakan Province. 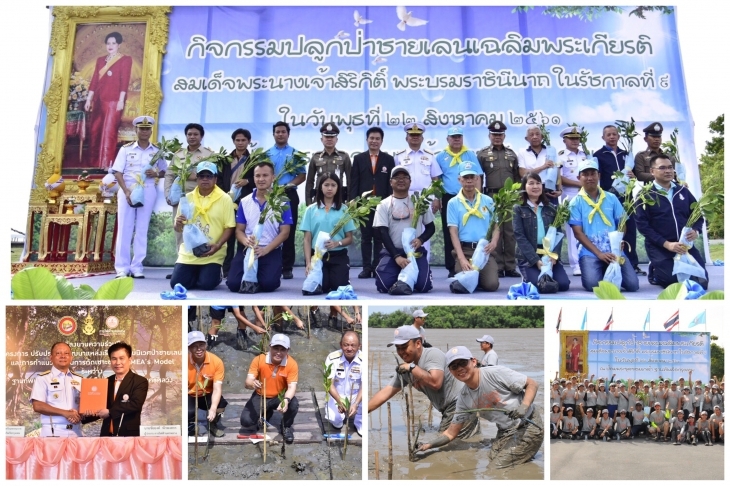 The MEA Governor said, MEA has been consistently conducting conservation projects for the mangrove forests since 2004 and has recently supported a 5-year (2018-2022) reforestation and maintenance plan to protect coastal erosion at King Rama V Fortress of the Bangkok Naval Base with a budget of 2,000,000 Baht (delivered annually at 400,000 Baht) while supplying power poles uprooted from the overhead-to-underground cable conversion projects and old tires within a budget of 1,000,000 Baht to be implanted as coastal protection belts in the area of King Rama V Fortress, totaling 3,000,000 Baht. The project also included renovations of the exhibition center to uncover the world of beautiful mangrove forests and their surroundings. Recently, MEA has constructed coastal protection belts in the area of King Rama V Fortress by implanting uprooted poles wrapped with old tires to prevent erosion and to prepare sediment traps to cover a distance over 1,100 meters while collaborating with the Faculty of Science, Chulalongkorn University, in conducting studies regarding the environmental impact whose findings revealed that coastal protection belts made of power poles wrapped with tires had lessened the impact of waves, resulting in higher accumulation of sediments, more density of sprouts and fruits behind the belts, and high returns of various aquatic animals and numerous birds whose survival rates seemed to have increased. The studies also concluded that the tires wrapping the poles had neither been decomposed to release toxic substances which were harmful to the environment nor brought any negative effects on the growth of organisms or the mangrove forests. MEA’s success in converting power poles pulled down from the overhead-to-underground cable projects into coastal protection belts has made MEA Thailand’s only public utility state enterprise which has been awarded Asia Responsible Entrepreneurship Awards 2018 in Green Leadership on June 1, 2018 at Manila Marriott Hotel, Manila, Philippines. MEA has currently been moving forward with the overhead-to-underground cable projects while delivering power poles pulled down from every single project to be used as coastal protection belts to cover the coastal areas of Bangkok in Bang Khun Thian District over a distance of 4.7 kilometers. The reforestation activity to honor Her Majesty Queen Sirikit of the late King Rama IX was held to dedicate merit to Her Majesty on Her Majesty’s 86th Birthday by MEA and Bangkok Naval Base along with more than 200 volunteers who made contributions to all activities including sprout planting to create belts to lessen the impact of waves and to decrease the speed of storms before hitting the shore to prevent damages which may occur to the residential areas and the lands belonging to the villagers. Also, the belts would create ecological systems to serve as food resources and habitats for the aquatic animals as well as nursery areas for the embryos. The activity has been conducted to encourage all participants to feel responsible for the conservation of the mangrove forests and to share their knowledge with the public and those living in coastal areas for sustainable rehabilitation of the mangrove forests.